The Rockville HD5 is a complete all in one powered bookshelf home theater system! There is nothing else you will need to purchase to take advantage of the amazing features these studio quality speakers offer. These speakers put out 600 Watts Peak / 150 Watts RMS. These power ratings are true-world ratings! 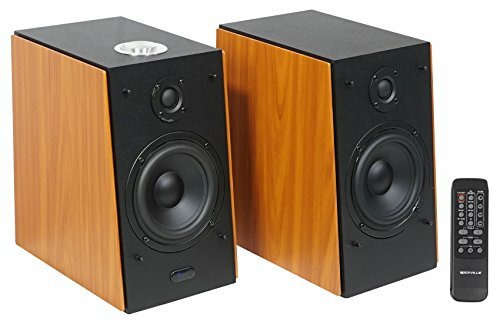 Please be careful when comparing to other speakers on the market. Even famous brands started inflating there power ratings. The speaker cabinets are made from top quality MDF wood which is an important and sometimes overlooked factor when it comes to great sounding speakers. Each speaker has a powerful 5" woofer that delivers loud clear and punchy bass. The .75 inch tweeter delivers crystal clear highs. The built in Class "D" amplifier with advanced digital sound processing gives the best sound quality on the market. These speakers feature Bluetooth with a range of 33 Feet and perfect signal transfer so you won't experience any loss in audio quality. The built in USB playback allows you to play back songs stored on a USB drive. The optical input allows you to easily connect to your television. The 2 AUX input ports allow you to connect the speakers to your TV, phone, or any other device. These speakers feature 4 preset EQ modes. You can select movie, music, news or 3D mode right from the included remote to custom tailor the sound to what you are using the speakers for at the time. These speakers feature a stylish sleek wood finish design with a multi-color LED indicator to enhance the look of any room they are being used in. Rockville HD5 5" 150 Watt RMS Home Theater System w/Bluetooth/USB/AUX/Optical. 5" Woofer and 0.75 inch tweeter in each speaker. Audiophile-grade ultra-stiff paper woofer cone for excellent mid and low frequency response. The Silk dome tweeter gives crisp and realistic sounding highs that you can't get with any other kind of tweeter. 600 Watts Peak / 150 Watts RMS - Crazy loud! Best sound quality on the market! Built-in Digital class "D" amplifier with advanced digital sound processing gives the best sound quality on the market. Built In Bluetooth (Version: 4.2+EDR) with 33 foot range with perfect signal transfer with no loss in audio quality. Built in USB playback allows you to play back songs stored on a USB drive (16 GB Max storage). 2 Aux input ports allow you to connect the speakers to your TV, phone, or any other device. 1 Optical(PCM) input port allows you to easily connect to your TV. 1 Coaxial input port. Multicolor LED function indicator. Includes a beautiful fully functional remote control. 4 preset EQ curves Music, Movie, News, 3D. Cabinet material: Beautiful wood finish Top quality MDF (0.472" inch thick high-grade MDF). Auto switchable 110/240V for use in both U.S and Europe. Sleek Wood Finish. Specifications: Power Supply: SMPS AC 110V-240V 50/60Hz. Impedance: Woofer is 6-ohm and the tweeter is 5-ohm. Frequency Response: 50Hz-20KHz. 11 oz high BL magnet. S/N Ratio: ≥ 72dB. THD: ≤0.5%(1K/1W). Input Sensitivity: 500mV50mV. Voice coil: aluminum former with 100% oxygen free copper wire. Woofer construction: 1-piece t-yoke (this adds SPL and increased the BL rating). Audiophile-grade ultra-stiff Pressed Paper woofer cone. Polypropylene dust cap. Dimensions of each speaker (inches): 9.84" W x 10.83" H x 6.38" D. Shipping carton dimensions (inches): 22.32" L x 17.56" H x 13.46" D. Net Weight of both speakers combined: 13.90 lbs. Shipping weight: 33.95 lbs.